Apollo is one of the most integrated healthcare delivery organizations in the world, incorporating hospitals, birthing centers, polyclinics, various diagnostic facilities, dentistry, pharmacies, and many others. The team of AHLL and Apollo Clinic network includes more than 5,000 doctors, paramedical, clinical and other staff, as well as numerous management and marketing professionals across the country and abroad. If you are looking to work with a truly global organization, with cultural diversity and an international team, Apollo is where you should be. 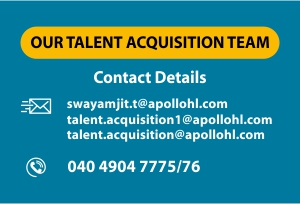 Please contact our Talent Acqusition Team below further.